DNA re launches the former G4 to "DNA F4"
All the design & tooling work for the former racer / foiler / cruiser G4 was made by DNA / Holland Composites, the builders of the DNA A-Class, after the Gunboat bankrupt , DNA continued to work on the project by themselves. 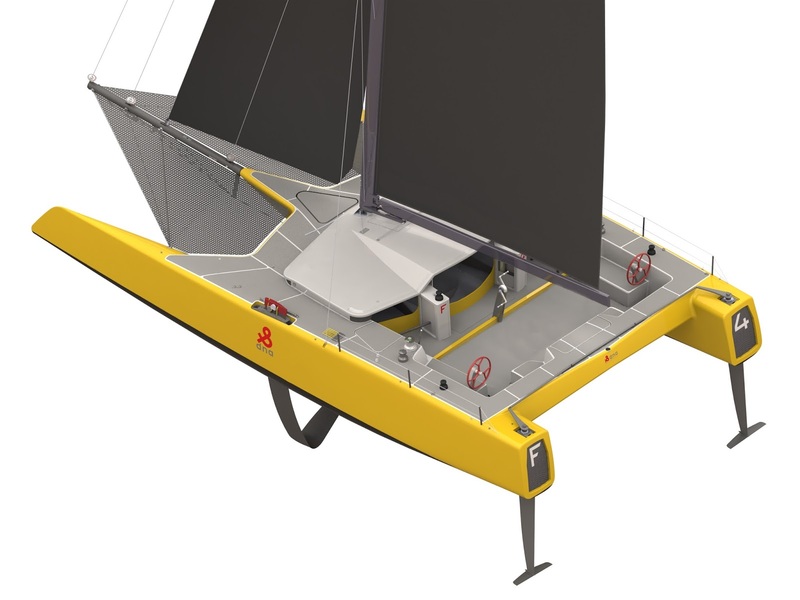 Below latest press release from also new branded "DNA Performance Sailing"
DNA announces the F4, the first foiling offshore one-design catamaran. Lelystad, The Netherlands: (June 15, 2016) -- Hot on the heels of the recent presentation of their F1 A-Class catamaran, DNA is proud to introduce the new F4. boundaries of distance one design racing offshore. Built in Lelystad, the boat is the result of an 8-month design project spearheaded by DNA’s lead engineer and Shannon Falcone. The plan is to launch and commission in Newport, RI in summer 2016 and spend the remainder of autumn in New England testing the boundaries of the boat’s capabilities in preparation for a busy winter racing season in the Caribbean. In the same way that former A-Class world champion Mischa Heemskerk influenced the ergonomics and system development on the DNA F1, America’s Cup and Volvo Ocean Race veteran Shannon Falcone has been the technical advisor for the DNA F4. “The team at DNA gave me the opportunity to propose new concepts and features that integrate my past America’s Cup and Volvo experiences following my feedback from sailing the G4 both inshore and offshore. Thanks to the support of our partners this boat is the result of an industry wide collaboration to help bring one-design production foiling into a real world racing environment. The DNA F4 is aimed at owner drivers looking for performance, efficiency and drastically reduced operating costs,” says Shannon Falcone. More information will be available soon on www.dnaperformancesailing.com. DNA is part of Dutch-based advanced composites constructions company Holland Composites. In addition to 25 years of carbon boat building experience, Holland Composites serves various other markets with niche composite products such as architectural façades and tidal turbine blades. DNA also designed and built SAIL magazine’s 2015 ‘Best Performance boat over 30ft’, the G4 which was offered by DNA to Gunboat for further resale. Shannon Falcone is a 34-year-old professional sailor from Antigua who grew up racing in the Caribbean. He has competed in four America’s Cup campaigns, and was onboard Oracle Team USA for their successful 2013 defense in San Francisco. Furthermore, he has been involved in two Volvo Ocean Races with Puma Ocean Racing and currently competes on Comanche, the 100ft super maxi built to break records. He enjoys kiting, paddling and sharing his passion for water with family and friends. Follow Shannon on social media via @racingsf. DNA F4 rendering. Copyright DNA.